This contest is open to individuals aged 18 years and above. Each entry must be submitted with a valid contact details, specially e-mail address, phone number & country. These will be used to notify you, if you win. 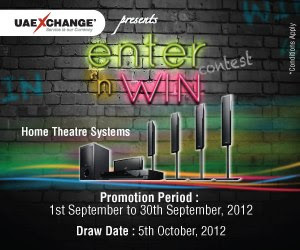 The winner(s) will be picked through a random computer draw and announced on UAE Exchange Facebook page on 05th October, 2012.